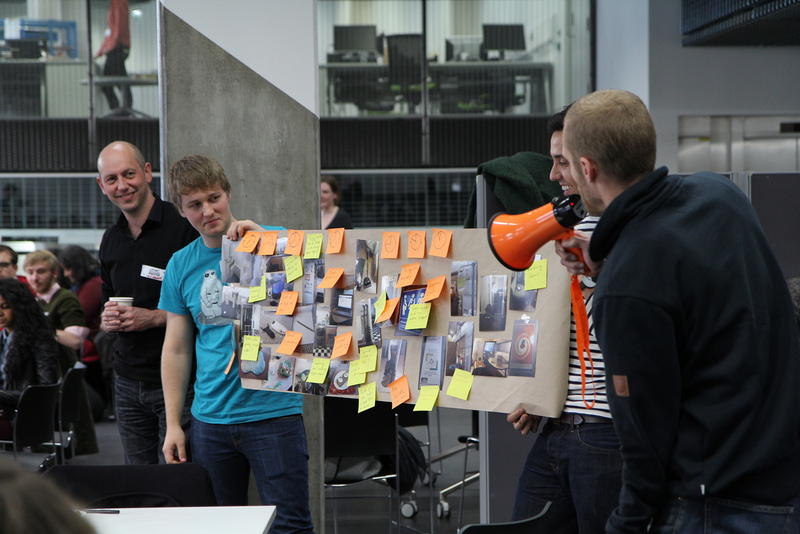 - What would you give back to users participating in your design process? - What are the issues of IP, and who owns what? - When is an open approach better than a closed one? 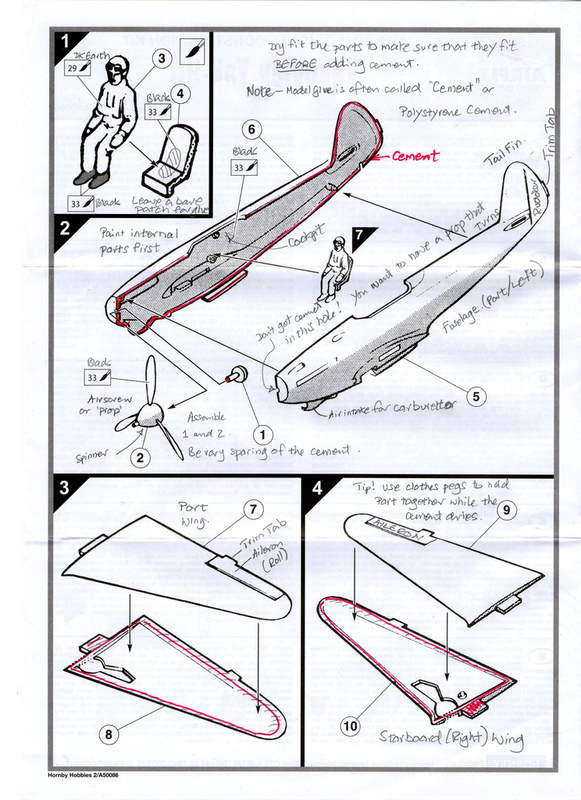 All good points if co-design becomes more common place, but you always have to ask is it the right tool? I have been working on several papers, which in due course I will be able to release. Norman Potter, What is a designer? always a classic and a total favourite of mine, trust me this is great with fantastic definitions and detail. I have had my first paper accepted to the "Crafting the Future" conference in Gothemburg. If some of you are coming along then let me know it would be great to meet up and discuss open design, the complications and the positives. I have also been working on a paper for the HCI conference in Vegas coming up next year. These take allot of work so sorry that the blog post recently have been a bit thin. 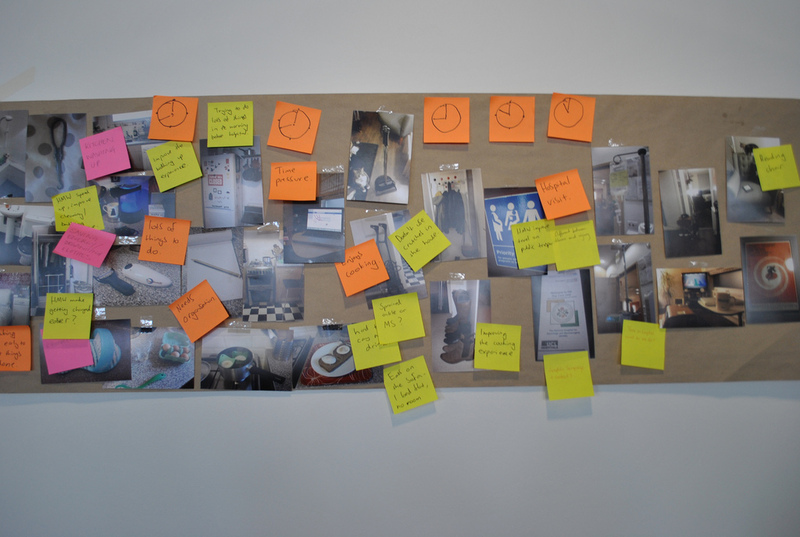 We at the Artefact cafe are also writing up the workshops and report that we have been working on for a while now. I have been working on the next stages looking at how I can collaborate with mixed industry partners, I will let you know more as and when I can. I am always asked about 3D printing, I will be honest think of it as a clever pen. It is a tool that should be used for the right reasons. The exciting factors about it are; Design freedom, design responding to niches and bespoke requirements, distribution based services. But when you start using it... which one should take priority, which design value do you design around... my answer? The user and viability. 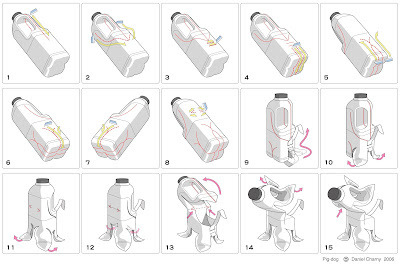 - Who should create the instructions for your product? 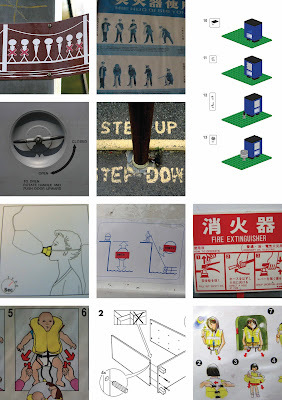 visual and pictogram become the right format? ... At the end of the day as we proved at the Mini Maker Faire, if someone cannot build your make... then what is the point in making it? I welcome your comments. The other image is of a parent putting a life jacket on an infant, it is the reassuring smile from the glasses wearing parent in a calm happy environment that makes me laugh... I am sure that it is not like that. 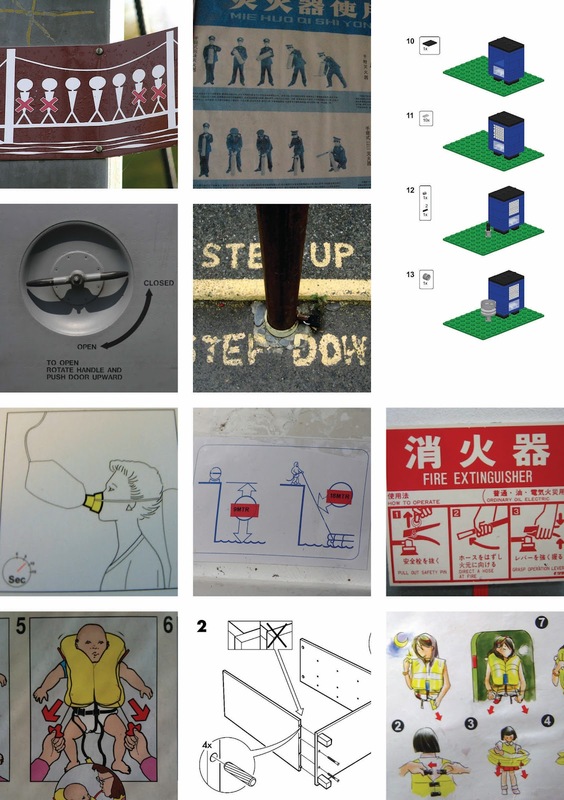 This week I have been reading around the creation of instructions and the processes that go with cognitive load that we place on users constructing products. Below is an extensive reading list if you are interested in this field. I have been working towards writing a paper and tutorial (workshop to most people) for the HCI conference in Vegas in 2013 (here). 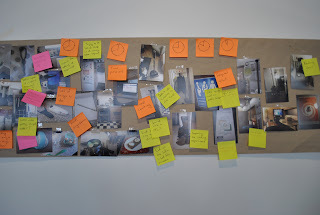 The artefact cafe ran a design workshop at Maklab over the weekend, this was very successful with a series of insights and details that we will be writing up and sharing soon. 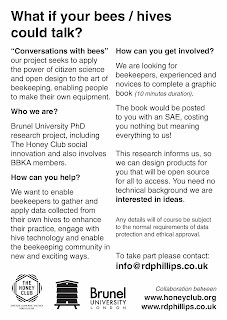 I have had an amazing response from probes with the "Conversations with Bees" project, we will see where this goes and I will update you when I can. 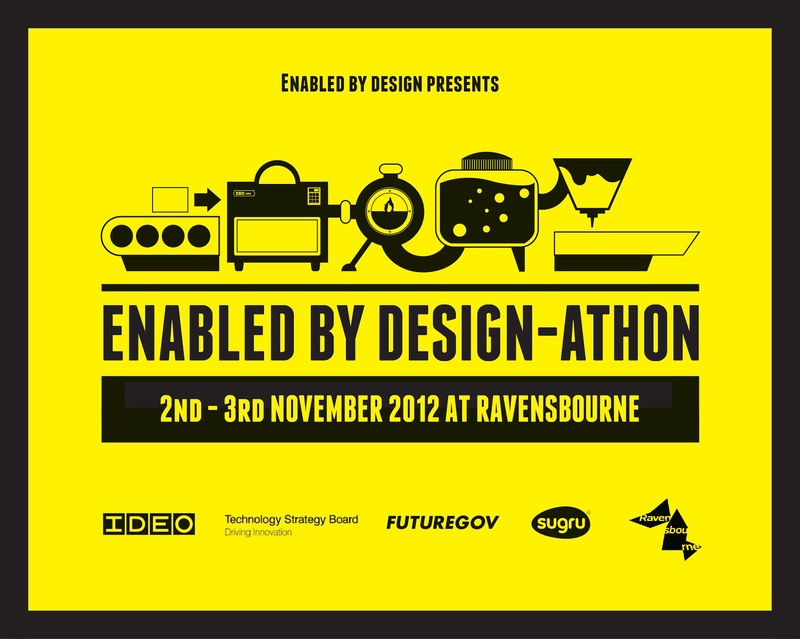 I was kindly invited by Enabled by Design to talk at their "Design-athon" last week. This was a great couple of days that brought together through Open Ideo, Sugru, Futuregov, Ravensbourne and government 3D printing funders. There were great speakers that I was honoured to talk after including Tom Hulme founder of Open Ideo and Design Director there. The talks covered a wide variety of design giving people a wider knowledge of design. The attendees were then split into groups with designers, facilitators all focused around a specific need or requirement. Photos are from the flickr group (link here) care of; Murtz Abidi, Matt Dexter and Michelle Douglas. There was a wide variety of design approaches from redesign through to completely new concepts, I could not stay for the whole 48 hours so please check here for all of the details and results of the days. 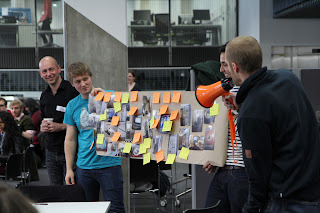 There was an amazing atmosphere with well organised themes to focus participants, with people using empathy tools and a wide variety of insightful tools. There had been allot of thought about the detail of the day but in the main it was about grouping mixed discipline groups with a specific user and access to workshop facilities. A great Day Thanks for the hospitality! A really interesting approach to methodologies and engagement this is worth a look if you like research methods and trying different things, simple, well put together and very useful. I am sorry that I have been quiet, I have had some writing deadlines. We presented a poster at the horizon conference in Aberdeen. The poster was looking at inputs and outputs of open design, this is starting to ask the bigger question of what is open design. The most important word in there is design, ie giving people a set of choices but also limiting them in some way so that the outcome is a positive one. This would change for different skill sets. It is abit like Nike ID a simple interface that lets you design a shoe and other apparel. This is a good formula... but you only can create a shoe, you do not get the data or the files to use to make something else. This is a mass customisation tool not really open design but we can learn many lessons from it. Keep thinking about where and the level of detail that you want to be open for a project to be successful... does it have to be all of it? Chris Anderson, Makers the new industrial revolution. This is a good read mainly full of anecdotes of how he has made things for his children and a history of how his relatives would have changed their approach to making and entrepreneurship. This is a great overview of "making" but it does also bring up and discussion... just because we have access to it does that mean we can "design" with it. I do not mean style but optimise on materials and processes from knowledge... in a world where things are costing more and material prices are going up is this software's time to help the optimisation of FEA for the Layman? - What is open design & when is a project better open than it is closed? - How is IP going to work with open design? - Who owns a project or concept when involving open design? - Who will embrace open design? There are so many more but these are the interesting ones, if you want to discuss please add to comments at bottom of blog. Putting several things into papers and preparing for a few conferences. As part of the Artefact Cafe project we set-up a workshop at Look Mum No Hands, a truly great community bike shop. The shop itself has a great community of bike users, from commuters to couriers. The shop is set up as a cafe with a workshop. When you walk into the shop you are offered with free water, free air (for tyres) and access to a lock for your bike. There is a great range of food and drink as well as bike servicing. The community is a good reflection for what the project was looking for. We installed some Up Rapid prototyping machines in the retail space for two days. Participants signed up for a workshop where they were signed a design team and used our catalogue of parts to clip something on to their bike. We were not there to design bike parts due to the prototype nature of the technology and ensure safety. The participants were taken through the ethics process and made aware of the prototype nature of the workshop. there were retail fixtures but we had rules about the workshops, ie not competing with the shop. There was a great response from passers by, people who already use the shop with suggestions and possibilities. I will leave most of the results to be published by the Artefact cafe blog. 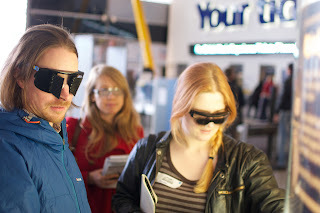 These workshops were part of London design week. The testing of rapid prototyping in retail spaces leaves quite allot of holes, that I am sure people will comment on but this has also been in the news as New York gets its first high street shop with 3D printers installed in it. I have been asked many times what my opinions are on 3D printing. It is an amazing technology but it is still a clever pen, I like to think of it as the 2d printing press. When the printing press was created it enabled the distribution of material and communication to a wide audience enabling more viewpoints and information. The information and distribution is the interesting factor, the same is to be said of 3D printing, to be able to manufacture to a power of 1 or manufacture on a distributed network by amateurs and professionals.. now that is interesting. There were discussions on Intellectual property and 3D printing, how this can change the world, are we just giving people the access to producing crap? What are the next steps... This discussion is huge and be added to. There were some points raised on twitter criticising why we did this, but I think that they took things out of context.. always remember the context. The Geek Manifesto, Mark Henderson. A very insightful publication into the politics funding and aspects of science, well worth a read. Monitoring matters; examining the potential of locally based approaches. Educating citizens about their coastal environments; beach profiling in the coast watch project. 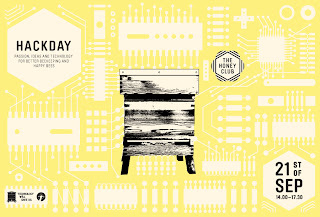 It was a great honour to be invited to run a mini design workshop station at the Honey Clubs tasting this week. 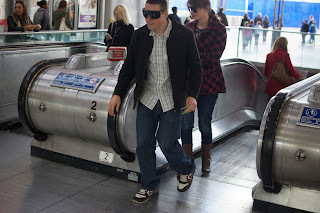 There was an amazing variety of flavours from all over London. There were also beekeeping intiatives there like bee collective, The London Beekeepers association and the Bee farmers association. It was fantastic because they had members of their Kings Cross community come and introduce people, this included mini speeches, poems and rapping. It was great to see a community so engaged. I ran a small design exercise to get people talking and engage the visitors. There were amazing honey lollies made by their resident chef and a great deal of good conversation and tips from beekeepers of all walks of life. I have been going through the results form last weeks maker faire with Dan Lockton, when we have catalogued them I will let you know the insights, please bear with us as we want to publish them if they are exciting enough... which we think they are. We have been preparing for the "clip it on" workshop at look mum no hands that is happening this week during the London Design Festival. If you have not signed up then please sign up here and come along. It has been a bit busy, so I will add reading lists again from next week. 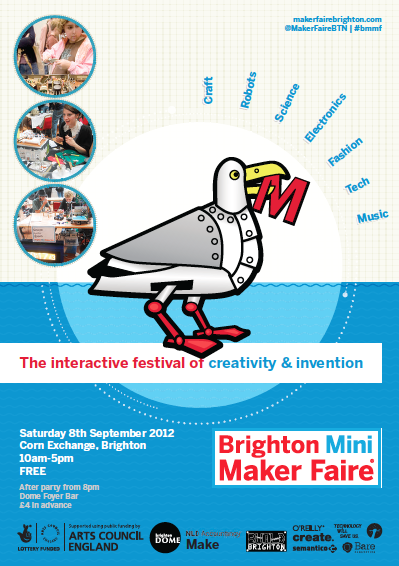 Maker Faires have been going for years in the US but last year was the first Mini Maker Faire in Brighton and this year it took over the whole of the corn exchange, A big venue. There was an amazing mix of craft, Arduino, darleks, teaching and people interested in making... stuff. Technology Will Save Us and the science museum were there running workshops and the atmosphere overall was amazing due to the diversity of projects. I was there with Dan Lockton looking at how people created instructions. This was a simple postcard activity that got people of all ages thinking, drawing and making. There were people from Ikea that came round and said hello interested in what we were doing. There were some really interesting mixed results, these will be published appropriately later. The task was to make the instructions for either fire making or tea making. There were also some lessons on using a bowdrill and different kinds of tinder to use and how to make charcloth but that was not really the intention of the day. The workshops were really well received and thank you to all that took part. Due to the nature of being indoors we were not actually allowed to make fire, but we had a cheesy, awesome mini arduino fire simulator that kids of all ages (including adults) liked. These are notes for myself but they might have application for other things? Me and Dan Lockton are taking part in the Mini Maker Faire in Brighton next weekend, we will be running mini workshops looking at how people create instructions. Learning from this then thinking about how to help improve the uptake of peoples projects by simple guidelines for this process within open design. We will of course open this discussion up to you all. Thanks for all of the support that I have received, there has been so much interest in the project which is great. Thank you!!! 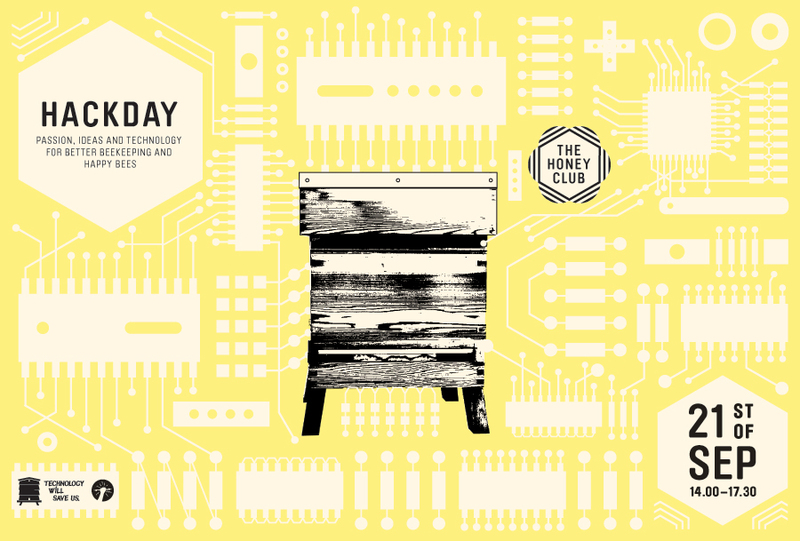 There are still some tickets left for the hackday here. - Have something you want to clip on to your bike? - Want to play with 3D printing? 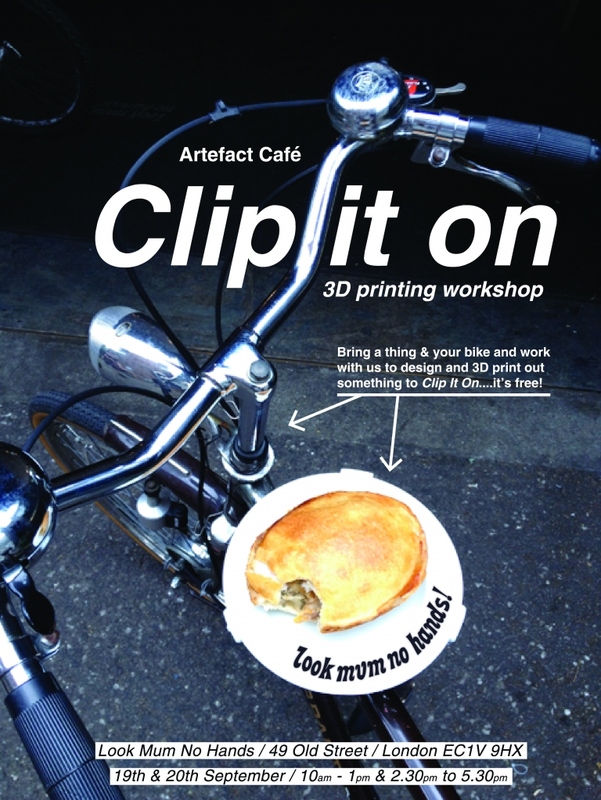 - Bring a thing and your bike and work with us to design and 3D print something to clip it on. 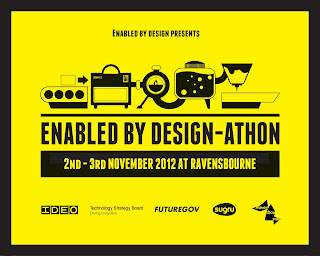 During London Design Week we are running 4 free mini workshops on the 19th & 20th of September, 10am to 1pm & 2.30 to 5.30. Parts will be printed during the workshop but if time runs out we’ll get them to you. 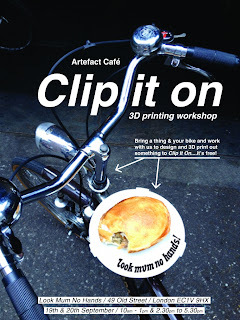 Clip It On – are 4 fun mini workshops that Artefact Cafe will be running at Look Mum No Hands over 2 days during London Design Week. 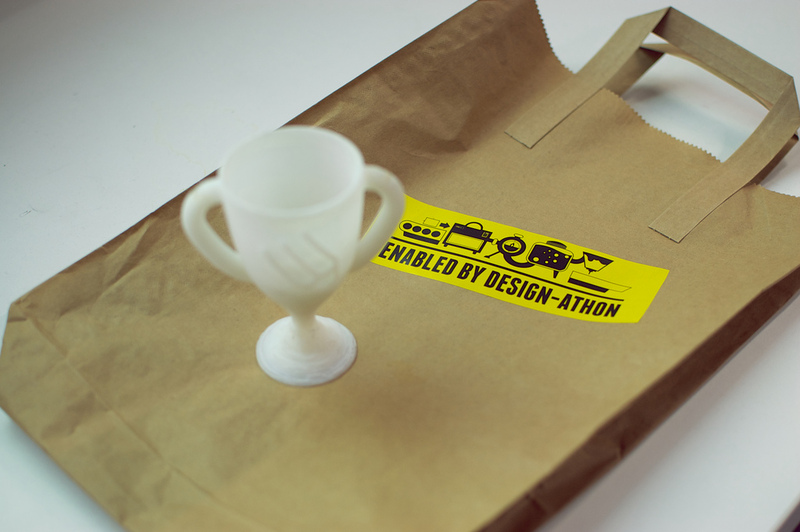 Uniting keen cyclists, self motivated design and making with desktop 3D printing technology. The workshop will focus on fabricating 3D printed parts that enable items such as lights, cameras, phones, tools and anything else to be mounted on to the frame of a bike. Suprise us with what you bring! 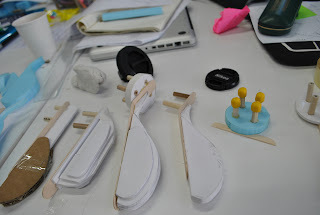 Each of the mini workshops will run over 3 hours, we will consult with participants to design & customise 3D parts and then fabricate onsite using 2 desktop printers. Some parts might not be printed during the workshop but we will aim to get them to participants either on the day or very soon after. We only have space for 4 participants for each workshop but if you don’t get a space come down and have a coffee, check it out and have a chat. I am still looking for beekeeping participants please see bellow. This is key, make sure that you weigh and sort the pack so that the cost is reduced. Remember that you will have to put an SAE in the pack so the cost goes up, or is there another collection access point. Think about the receiver, you do not want them going to the post office to pick it up because it would not fit through the door, all of these mini points are critical as they mount up to the input time that people put in. I use Printed books as they include as many people as possible, you could develop an app but then you are excluding people without that piece of tech. You have to think about what you are analysing. Think about the quality of the items, how they are received. It makes a huge difference, if you do not care about how it is put together how do you expect someone else to? Use the easiest method to make them, be a designer, think of how you can do this quickly as otherwise it will soon take up a tremendous amount of time, also think about how you are going to analyse them before you design them, do they need to be compatible? Preparing for the honey flow that has hit very quickly with supers filling all over the place. Rather than preparing the whole of the frame with foundation some keepers only use the top 5mm as a start and let the bees do the rest. Sometimes you can start a top bar off, this is trialling a method of taping some natural comb then in 6 days removing the tape. you always have to try things in bee keeping. well, there is always time for tea! This is an advert for beekeepers, this is part of the project that we are doing and will only take 5 minutes. you can download the advert (PDF here) (Jpeg here) or copy and paste the link into an email. I am looking for as many beekeepers around the country so please use Twitter, Facebook or email round to your network. 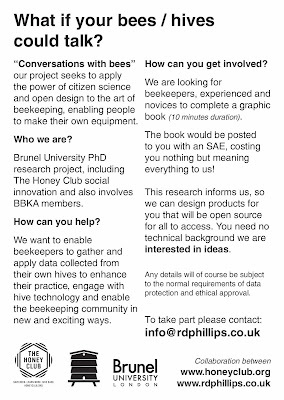 Our project seeks to explore how the power of citizen science and open design can enhance the ancient art of apiculture (beekeeping) - to enable beekeepers to engage with hive technology and connect with each other in new and exciting ways. 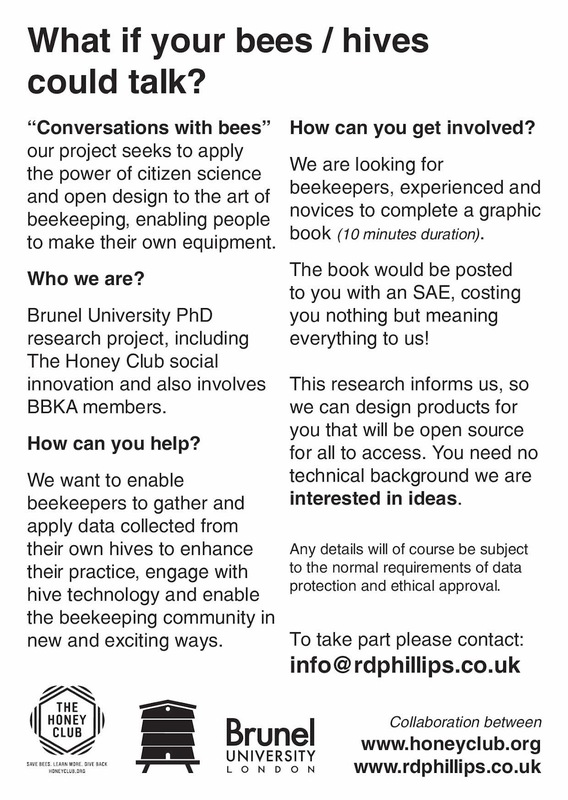 We're looking for beekeepers and enthusiasts to participate and engage with our project. You might be an experienced beekeeper who has lots of stories to tell. You might be an amateur who has only recently discovered their passion for bees and is brimming with ideas. You may be an apicultural enthusiast, culturalist, academic or scientist who has worked closely with beekeepers. Whoever you are, you must have a willingness to explore new ideas and solutions that will enhance the art of beekeeping and enable the beekeeping community. How can we use technology to 'sense' the world around us? How could this be beneficial to beekeepers? How can we evolve hive technology? How can help beekeepers connect and share data? How can we invent and create practical tools that beekeepers can easily put together themselves? We want to explore and answer these questions with beekeepers and related enthusiast – those who are immersed in the practice and issue everyday – so we can make sure the ideas and products we create are useful and practical for beekeepers everywhere. A product designer interested in how design can facilitate engagement between communities and users. He has 10 years’ industrial experience of commercial and academic product design including: mass manufacture, user engagement, user testing, prototyping and making. His clients have included: Puma, Quicksilver, d3o, Nokia, Ministry of Defence, BBC, The British Council, The Arts Council, The Victoria and Albert Museum, Goldsmiths Research Studio, DMR bikes and Google. A social enterprise created by us here at Wolff Olins (www.wolffolins.com) and youth development charity, Global Generation (http://www.globalgeneration.org.uk/). Our mission is to create the biggest bee friendly community in the world, starting with our local community in KingsCross. We are focused on saving bees, learning about sustainable practices and building a community through the practise of beekeeping. Technology Will Save Us is the first haberdashery for technology and education. This description springs from a belief that creating a strong understanding of the technology we use every day will lead to more sustainable and ecologically conscious habits. We aim to help everybody experience the joy of making technology work the way they want it to. We show people what they’re capable of with our DIY technology kits, our workshops and support services. We enable them to understand how to build new things for themselves by being more creative and resourceful with the technology in their lives. We had a visit to the science museum web lab, this is a fantastic space facilitating collaboration and a larger web experiment where you can integrate the physical and the digital. There are a series of activities from robotic drawing in sand to the creation of music. The most interesting element is that the physical objects have been created so that they still have a connection with product language that we know but also with a with something that is new. The QR code that you were issued with stored snippets of what you created, be it music, images, or musical compositions. 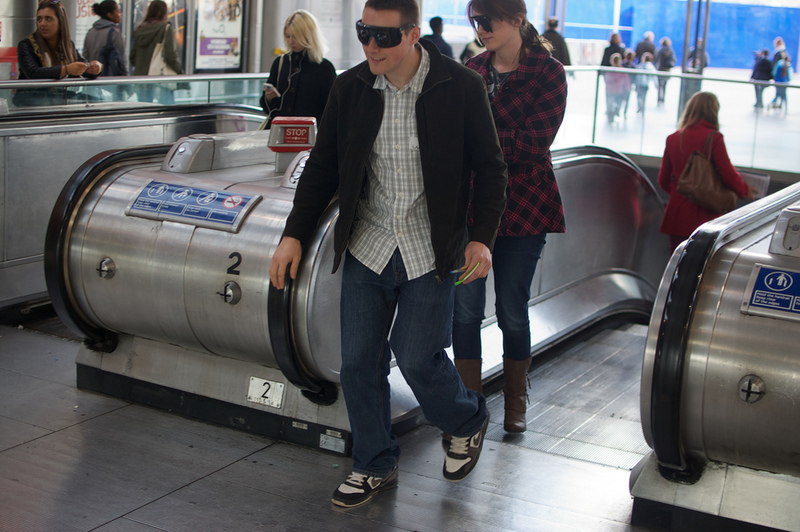 Second design probes are coming through, there will be a call for participants over the next few weeks. 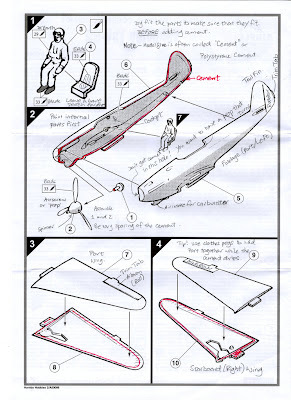 Me and Dan Lockton have been preparing for the Brighton Mini Maker faire, we would welcome your input, we are on the hunt for really bad instructions (below)... all will become clear later, please email them in. 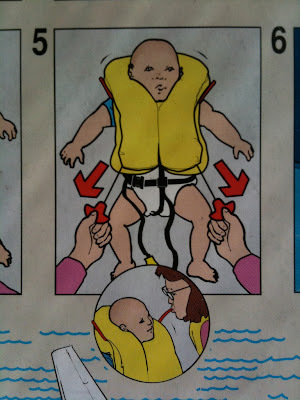 A photo will be fine. I have been writing up two papers that I will let you know about in due course. The geek manifesto, why science matters so far so good. I will let you know how I get on. This week has been a writing week so sorry for the short post. I have been involved in a beekeeping meeting in Brighton. There have been some great meetings and projects in progress that I will update you with soon. (Here) is a summary presentation of what I have achieved. We are planning some things for design week in london that is coming up so watch this space! 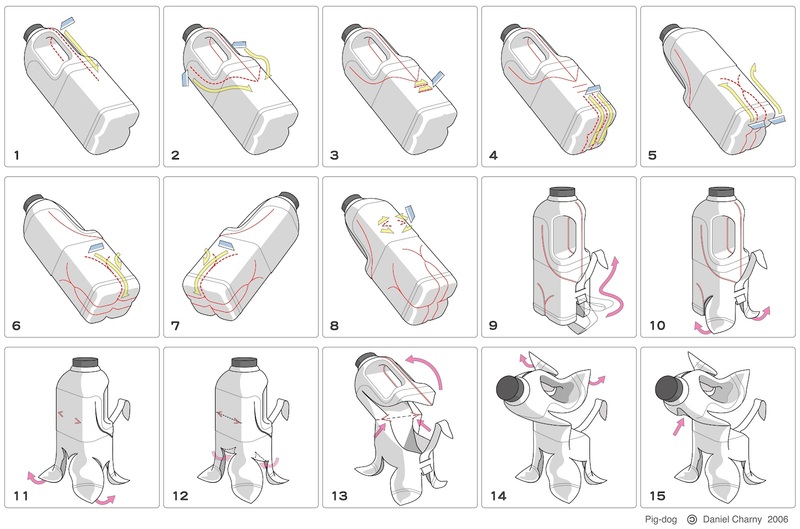 One of my favourite pieces of open design to date by Daniel Charny... its stunning pig-dog! How he saw the potential in the carton... I have no idea. there are many more but you will have to go back through the blog. There was a hosted BBQ and mini photo exhibition from the year, with a spot of urban beekeeping thrown in. Shame about the weather but a very good meeting. A summary of the best articles that I have read so far throughout the year, there are so many more but these are some of the most that I have referenced in papers etc. The vanishing of the bees, film This highlights the issues of Colony Collapse Disorder (CCD). this approach to mono cultures, pesticides.. This is a massive issue and a very informative documentary. Case studies in the personal fabrication of electronic products, David Mellis very insightful developments that MIT are making good definitions for open fabrication, ornament, personal expression and intellectual development. 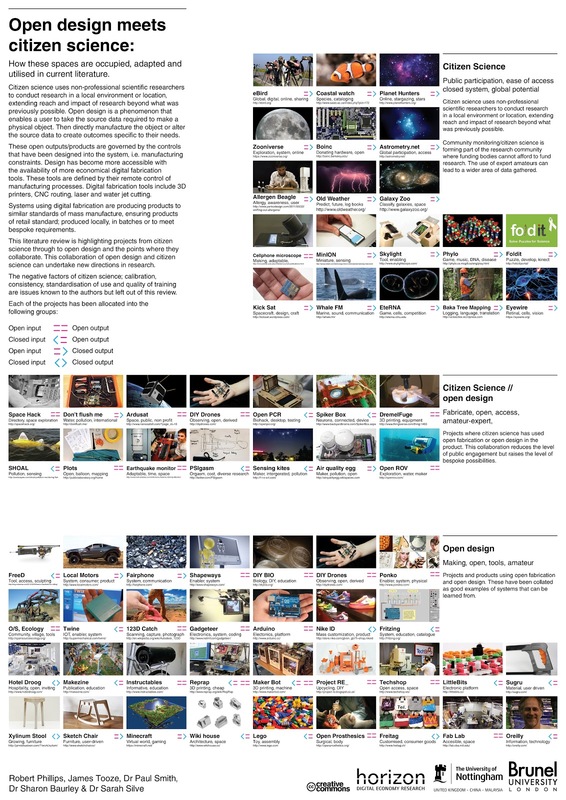 The future of open fabrication, the institute for the future the best thing that I have read in along time. great key principles of open design. (DIY) Biology and opportunity for HCI supporting that lo-cost technologies are supporting the non scientist to do things within the fields of science. Do honeybees, Apis mellifera scutellata, regulate humidity in their nest? very interesting and interesting to read. interesting insights into how people really use objects, an old text but still very relevant and worth a look. the previous papers are looking at how people learn and take in information. Planning a good workshop on several front with companies in Brighton and nationally. Wax moth that the hive rejected, looking after the integrity of the hive.